This is a short story designed to introduce interested readers to the authors Thrill Kings series. The story is short and intense involving a rescue of a family that is in danger. The reason for the danger has to do with a few science fiction constructs that I’m not sure I have figured out well enough to explain. The short version is that for reasons I won’t go into abrasions or “bleed zones” have developed between two different dimensions. This interaction between dimensions creates issues. 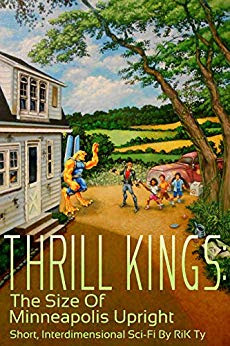 The Thrill Kings in this story and presumably the other books in the series are expected to save the day when things go wrong. This tale is well written, the characters are well-developed, and the story intense. If it sounds like your kind of science fiction, give it a try.